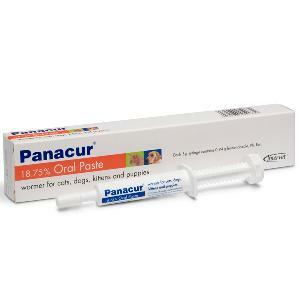 Panacur Oral Paste for Dogs & Cats treats against gastrointestinal roundworms (nematodes) & Giardia protozoal infections. Panacur Oral Paste for Dogs & Cats treats against all types of nematode worms, including ascarids, hookworm & whipworm (it doesn't treat for tapeworms though). To treat adult cats & dogs for worms, give 2 syringe graduations per 1kg weight in a single dose (one 5g syringe is enough to treat 9kg of body weight). To treat puppies & kittens under 6 months of age, give 1 syringe graduation per 1kg of bodyweight daily for 3 consecutive days (one 5g syringe is enough to treat 6kg of body weight for 3 consecutive days). Giardia infections can cause diarrhoea & are more common in puppies than adult dogs. To treat for Giardia, 1 syringe graduation per 1kg of weight is given daily for 3 consecutive days.